It reports an identity threat and won't let me continue to the site. How do I fix this? 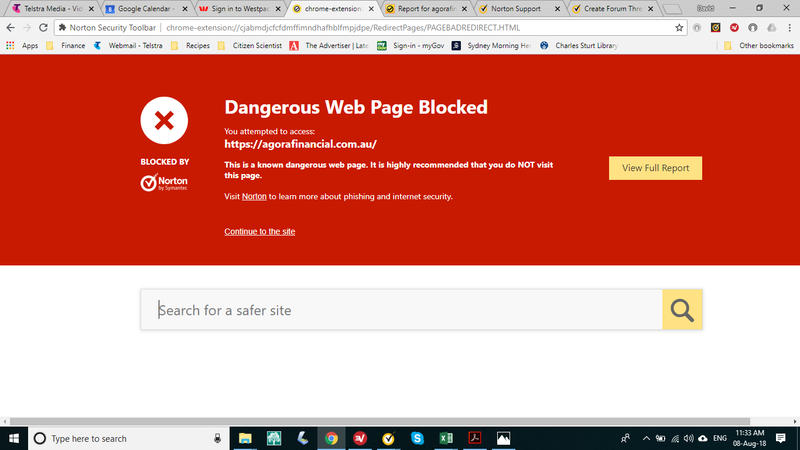 I will ask the Norton Safe Web Team to re-evaluate the website. Please stay tuned to this thread for a response from the Safe Web Team on Tuesday night after midnight EDT. We have manually analyzed the site 'agorafinancial.com.au' and found it to be clean so we have changed its rating to green. I'm glad that you are now able to access your website of choice. Since your issue is solved, could you please pick the post which helped you to solve it and mark that post as the solution.? You can do this by clicking on Mark As Solution located at the bottom of the selected post.